The month of December is always a time of festive joy with the Christmas holiday season mood setting in. 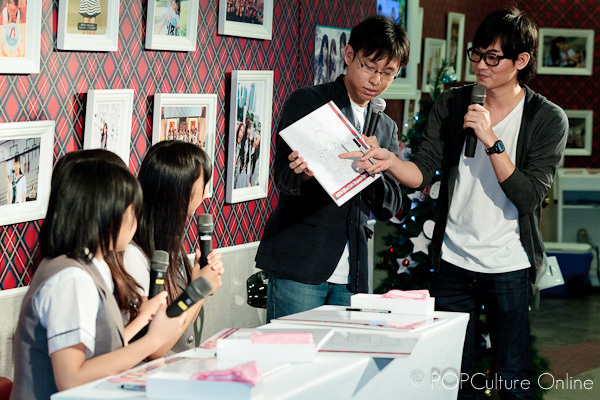 And for fans of AKB48’s sister group NMB48, Christmas came early as 3 members of NMB48 were in town for the NMB48 Special Cafe event plus a Handshake event later at the AKB48 Singapore Official Shop. For those new to the Japanese Idol Group scene, NMB48 is the sister group to the highly successful and popular Idol Group AKB48. The group is the newest addition and also the youngest of the sister groups with an average age of just 14 years old among its members. NMB48 was was formed in October last year, with Mr Yasushi Akimoto (producer of AKB48) as their producer. 25 members were chosen out of 7256 candidates from the audition, forming the 1st generation of the group. 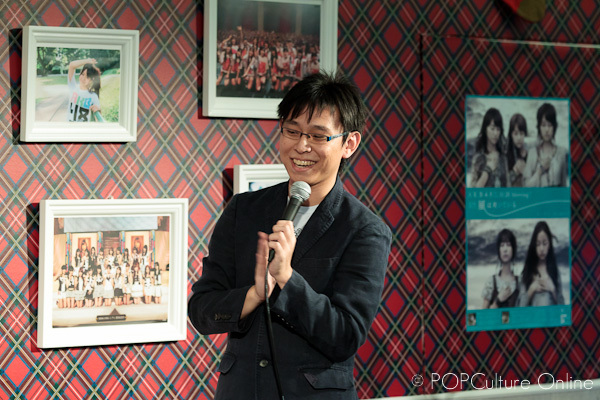 Co-Founder and Photographer Kenneth Wong made the trip to the AKB48 Official Cafe Singapore & AKB48 Singapore Official Shop at *SCAPE to attend the event that marked the girl’s first visit to Singapore and to soak in the Christmas atmosphere at the cafe as well. The first thing that struck me upon entering the cafe is the nice Christmas decorations that the cafe staff have put up. While Christmas is still a good 3 weeks away, you can definitely feel the Christmas mood in there. Even with a crazy down pour, fans still turned up in full force anxiously awaiting the appearance of the 3 members from NMB48, Rina Kondo, Nana Yamada & Ayame Hikawa. After the customary introductions of the 3 girls, the first part of the NMB48 Special Cafe event was a drawing competition. Each member was given a nicely decorated board to draw what they would want for Christmas this year. And for their effort with the two rounds of drawings, each member was given a little prize. 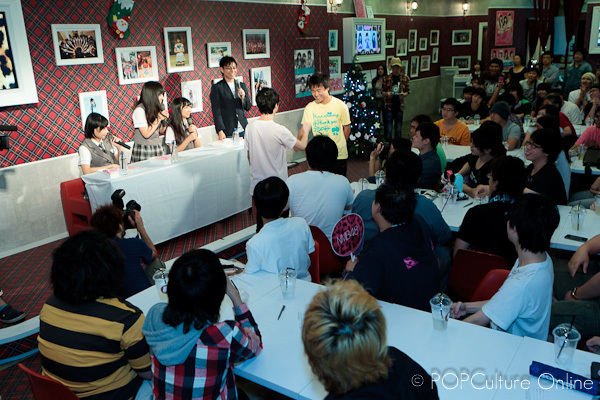 As with every cafe event, a Q&A session for fans to ask a question and the NMB48 Special Cafe event was no different with fans all over the region asking very interesting questions. Ranging from their favorite place to eat to which member of the whole AKB48 group do they respect and look up to. All 3 girls were happy to answer the various questions and even added on with their own unique blend of personality which made the Q&A session an enjoyable one. Next on the list of activities was a round of Janken or Scissors-Paper-Stone competition. This time round there was a twist to game with a special tie-breaker round to determine the eventual winner. Congrats to the winner of the Janken competition who walks away with an autographed single from NMB48. To round up the day’s activities, there was a special Handshake event held at the AKB48 Singapore Official Shop for fans who have purchased official NMB48 merchandises. While it has been a long & tiring day for the 3 girls with interviews and an earlier cafe event, their warm smiles and enthusiasm never left them as they greeted each fan. Watching Rina Kondo, Nana Yamada and Ayame Hikawa from NMB48 in action at the NMB48 Special Cafe event plus the Handshake event later at the AKB48 Singapore Official Shop has been a joy thanks to their cheerful personality and warmth. I am sure the fans also enjoyed themselves too with all the cheers and applause for the girls and I definitely look forward to seeing them back here in Singapore again.